From Gershwin to Garland puts the spotlight on two of the greatest figures in American Popular Song: composer George Gershwin and singing star Judy Garland. 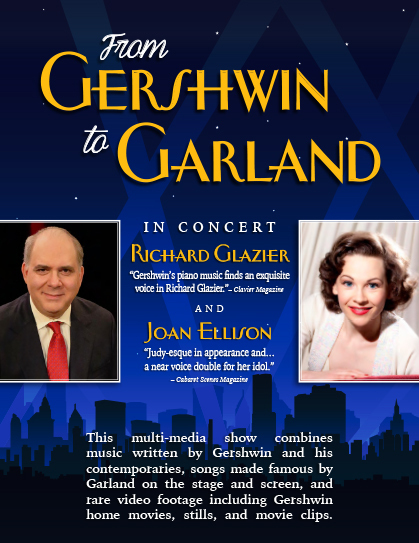 The multi-media show combines music written by Gershwin and his contemporaries, songs made famous by Garland on the stage and screen and rare video footage including Gershwin home movies, stills and movie clips. Pianist and host Richard Glazier won multiple Telly awards for his three nationally broadcast PBS specials. Vocalist Joan Ellison stars in a one-woman Judy Garland show in theaters and with symphony orchestras across the U.S., and has been called a “rare combination of artist, archivist, and arranger” by Michael Feinstein. Glazier is delighted to be back with Ms. Ellison in a unique and thoroughly entertaining show celebrating unforgettable music.